It's official: Record company EMI announced that it will offer digital rights management (DRM)-free downloads of its entire digital repertoire, and added that Apple's iTunes store will be the first to sell them. However, the Beatles' music won't be a part of this deal just yet, but EMI Group CEO Eric Nicoli acknowledged that "we're working on it, hopefully soon." When asked if the Beatles tracks are going to be online, Apple's Steve Jobs, who was also speaking at the press event, answered, "I want to know that, too." Jobs did seem hopeful that this DRM-free concept would spread to other labels beyond just EMI, saying that EMI is pioneering a concept that will probably become very popular. He added that he couldn't comment on the behind-the scenes discussions, and cited Sony's disastrous experience when it tried placing DRM on its CDs. 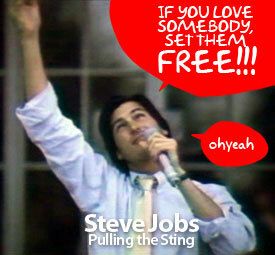 What did Jobs say about DRM on video and movies? When asked if DRM would be removed from videos and movies from Disney—the company in which Jobs is a major stockholder—Jobs replied that he saw video and music as two different things, where video was never distributed DRM-free as 90 percent of music has in the past. EMI said it was going to allow all retailers to sell the DRM-free tunes, and they will be available in AAC, WMA and MP3 formats. ITunes will offer the EMI DRM-free catalog as premium downloads, with twice the sound quality of currently available AACs, and they'll cost $1.29 per song rather than the $.99 per song from the EMI catalog that will still be sold with DRM.